Back to event recaps! 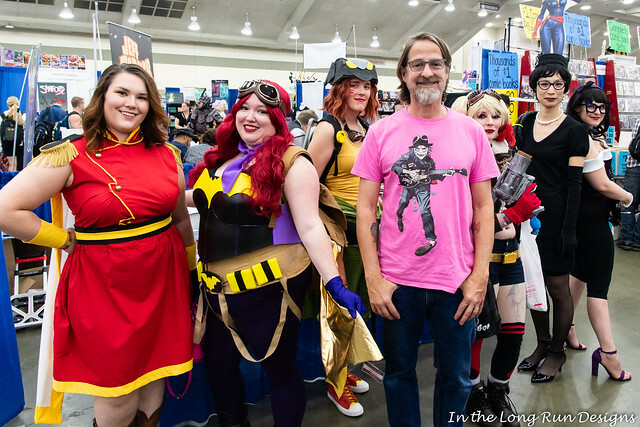 In late September, Mike and I went to one of our favorite cons, Baltimore Comic-Con. 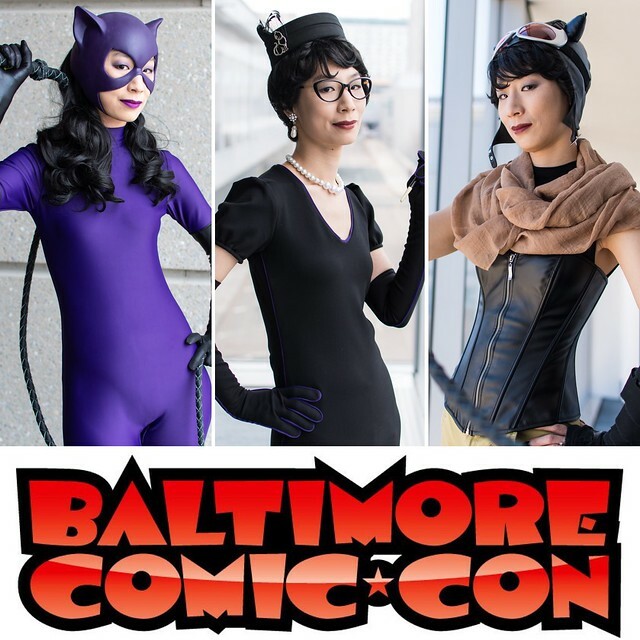 It takes place at the Baltimore Convention Center in the Inner Harbor area, which is an easy half-hour drive from our house. 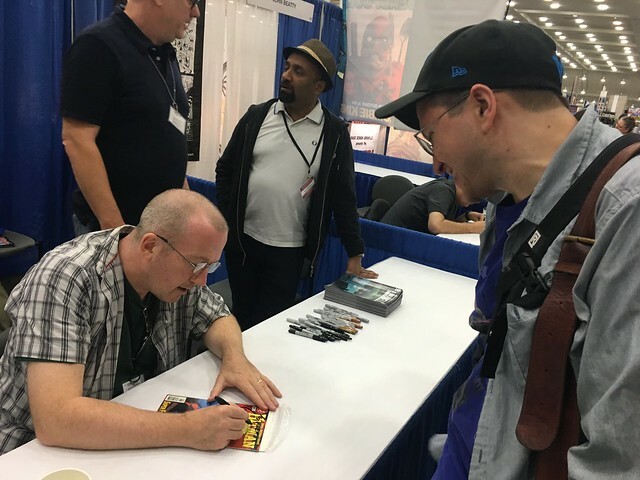 It’s a busy con, but not overwhelming (it takes up a lot of the convention center, but not all of it), and we have managed to meet a bunch of our favorite comics creators there. We had to miss it in 2017 due to an out-of-town wedding, so we were excited to go back. 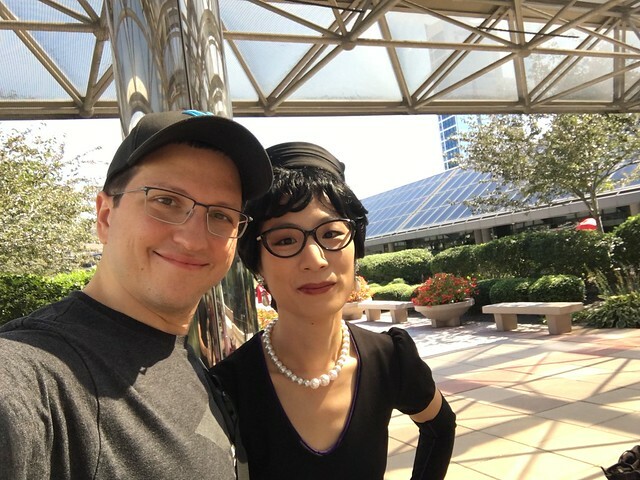 This post is about the con itself; I will post more about the weekend’s cosplay later. Since this is a comics-centric convention, I decided to go with all Catwoman cosplays for the three days. 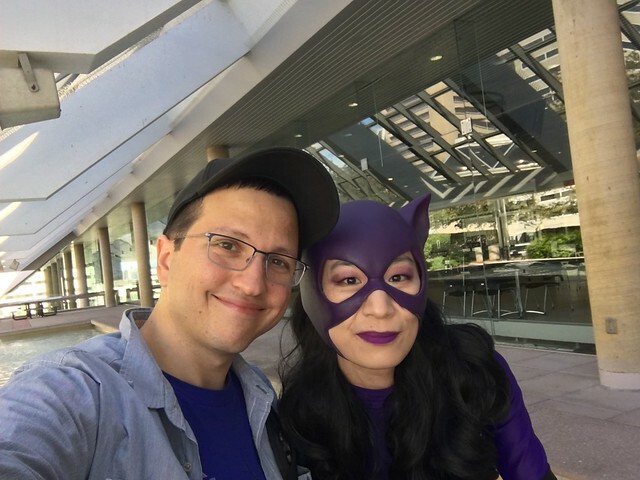 I wore my purple Jim Balent-style Catwoman on Friday, DC Bombshells Catwoman on Saturday, and Knightmare Catwoman (with Mike debuting his matching Knightmare Batman) on Sunday. 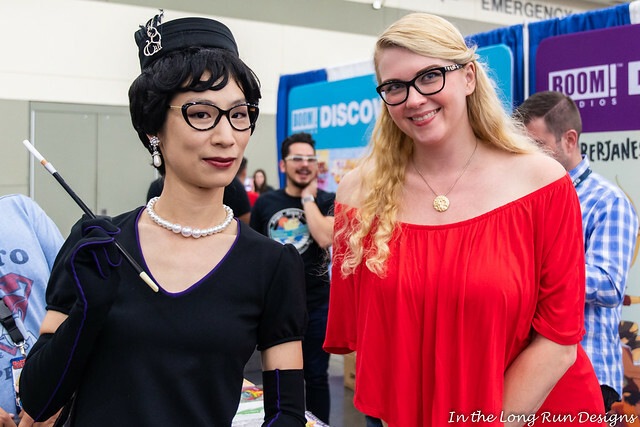 There was not much on the programming schedule that caught our eye for the weekend, so most of our time was spent exploring the expo hall, getting signatures from creators, and doing photo shoots. The dealer area and artist’s alley were quite large, so we did not have any trouble filling our time. The highlight of Friday was getting to meet Garth Ennis, the longtime comics writer. My favorite work of his is Hitman, but he has also written a lot of other great books, the most famous being Preacher. There was quite a long line we had to wait in, but the folks we were standing next to were cool to hang out with. We all had a good time talking about our favorite Ennis books. Ennis himself was super chill and friendly. I am always worried when meeting a creator that I will have a bad interaction, and that will then color my enjoyment of their work. But despite having to deal with a very long line, Ennis was really nice to each person who came up. He even signed a large stack of books (it looked like it might be the complete run of a series) for a guy in front of is. And he signed them quickly, too! We had Ennis sign two issues of Hitman for us. 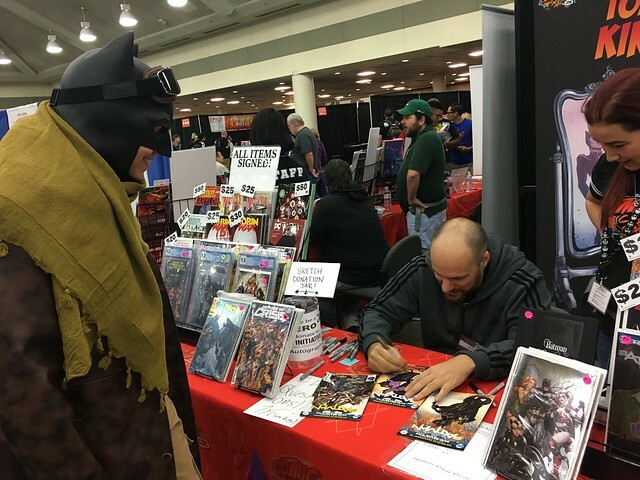 One was the Super Friends issue that we also had John McCrea, the artist, sign at a previous Baltimore Comic-Con. 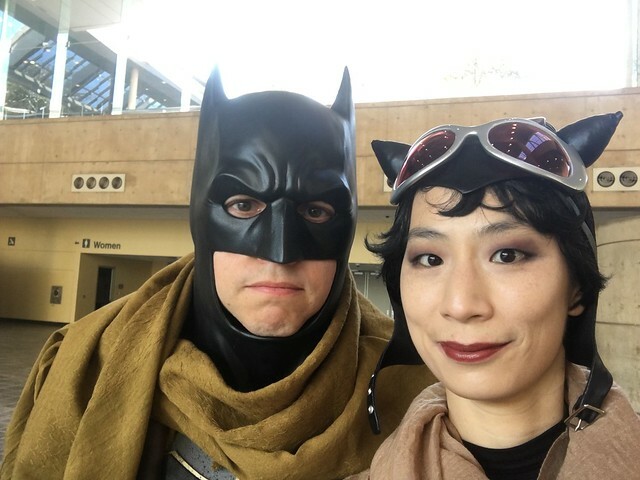 The second was an issue that featured Catwoman on the cover, since that is one of my favorite Catwoman cameos in a series, and since I was cosplaying Catwoman in the same outfit at the time. On Saturday, I took part in a DC Bombshells cosplay group that I organized. We had ten people participate, which was way more than I expected. I got to meet a few new folks in person, which was awesome. Mike was a trooper and did photos of everyone, despite the large size of the group. As an added bonus, there were two creators from the DC Bombshells comics that had tables at the con. In the morning I brought my copy of the first DC Comics Bombshells trade to be signed by the writer, Marguerite Bennett. She was super nice and complimented my costume. Later in the day, when I was with a bunch of the cosplayers from our DC Bombshells group, we got to visit with Sandy Jarrell, who has done art for both the DC Comics Bombshells and Bombshells United series. He was also really nice and complimentary of our costumes, and seemed pleasantly surprised that we wanted a photo with him. 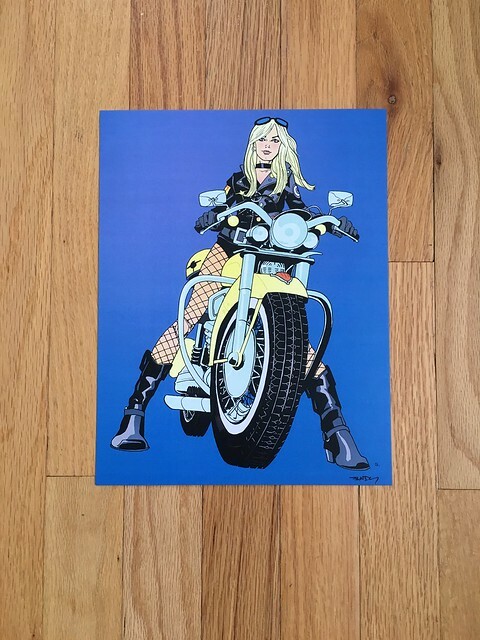 I ended up buying this very cool Black Canary print from him. On Sunday, Mike switched from being a photographer to a cosplayer, debuting his new Knightmare Batman costume. We have rarely done couples cosplays, and I have always wanted Mike to do Batman. The costume is not super comfortable for Mike, since the cowl and armor are not breathable, but he hung in there and lasted most of the day. In order to get cool photos of both of us, we scheduled a couple shoots, and the photos we got back are epic. I will share those in a future post. 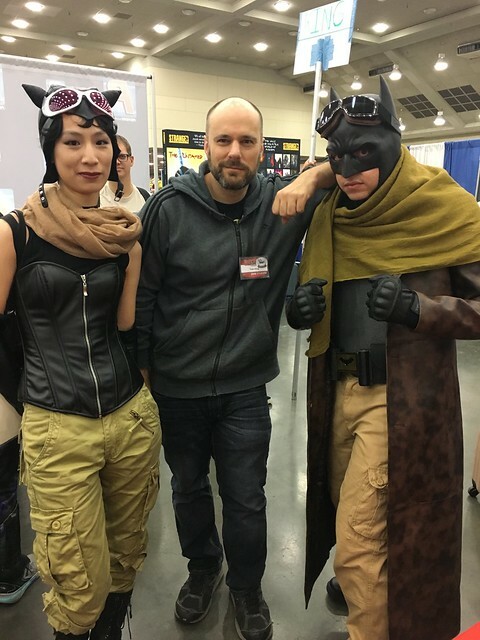 We were super excited to meet Tom King while wearing our cosplays. We have met him at previous cons, but he is the author of the story arc we based our costumes on (Rules of Engagement, Batman issues 33-35), so we had to see him this time. We got to the line quite early, which meant we were within the first ten people there. 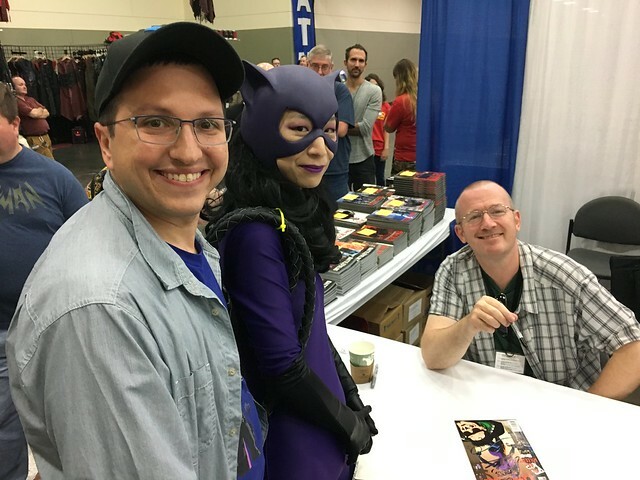 Tom King seemed super jazzed to see our costumes, signed all our books (we brought the Rules of Engagement arc, of course), and posed for a photo with us. The rest of the day was pretty much spent with photo shoots. Mike seemed a bit bemused to be on the other side of the camera so much, but he warmed up to it over time. And that was our Baltimore Comic-Con 2018. I cannot wait until next time!